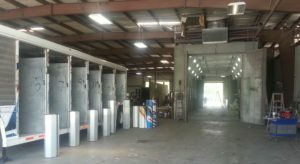 We offer a full line of refurbishing services at our 20,000 square foot facility loacated in Leesburg, FL. Our facility offers state-of-the-art processes with a crew of highly skilled and dedicated technicians to insure your complete satisfaction. We pride ourselves on fast and quality repairs and refurbishments that are O.E.M. condition or better. We also accept total accountability for your complete satisfaction. If you are not satisfied with any services provided, we will correct the problem at our expense. Refurbishing is our core business – Not an afterthought. High customer service has been the key to our success in. We repair and refurbish all makes and models of beverage trailers, transport trailers, trucks and tractors. In addition, we pick up, return and offer loaner equipment while work is being done. We also offer free, no obligation, fleet analysis to show you how we can offer refurbishment options to save you money. We always provide free estimates on any equipment. In addition we can paint and refurbish RVs, food trucks and other specialty vehicles. We are committed to your complete satisfaction. Contact us today for a more convenient and affordable way to maintain your fleet equipment. We can tailor work projects to meet your specific goals, and we can offer a large degree of flexibility in areas that will compliment your business. No job is ever too big or too small. Our goal is to exceed your expectations, and we will help you evaluate refurbishment and repair options that maximize your productivity and minimize your costs.